JAPAN .. yay! My swap partner, Amy Piesse of Impossible Juxtapositions, has received these (pic below .. not all of the stuff can be seen tho) last Friday! 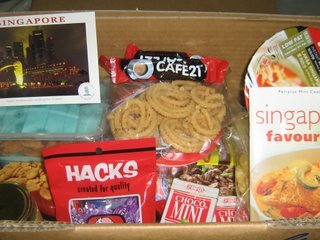 I included in the package - a postcard, a mini cookbook, a box of merlion choc, 3 premixes - assam fish, black pepper and fried rice, low fat instant noodles - singapore laksa and pho and also kaya spread. I also explained to her about the different ethnic celebrations in Sg and i included muruku, tapioca chips and satay broad beans as well. Also I added stuff that my family is currently enjoying or used to enjoy - cafe 21 coffee sachets, choco minis and blackcurrant hacks. And last but not least I baked for Amy, a box of choc chip cookies. "I got your package on Friday afternoon, thank you so much! And thank you as well for the letter which explained everything so well, too, it made a big difference, especially when you explained the different types of snack foods typical to each culture. I really really enjoyed the biscuits you made. I don't have an oven in my apartment, and being someone who bakes, I really miss being able to make homemade stuff like that.The packet mixes will be really good too, as it's quite hard to find stuff like that over here, especially things like the tamarind sauce, so again, thank you! I will admit that I was a little surprised at being sent noodles, but again, after the explanation in the letter and having a closer look at them, they will make perfect lazy lunches for when I can't be bothered making something to take to school. So thank you again, I hope your swap partner was equally thoughtful and generous. Amy. " No worries Amy, I had so much great fun putting together that package.